The PROFAUNA team has visited forests in 6 sub-districts in Malang Regency to collect information on the existence of the protected hornbills. The visited sub-districts were Ampeldaging, Sumbermanjing Wetan, Donomulyo, Bantur, Tirtoyudo and Gedangan. The survey was also conducted in the areas that were once forests, but now have been converted into agriculture areas or plantations. In the survey covering 28 villages in the aforementioned sub-districts, PROFAUNA focused on recording the existence of 3 species of hornbills: oriental pied-hornbill (Anthracoceros albirostris), wreathed hornbill (Aeros undulatus) and rhinoceros hornbill (Buceros rhinoceros). The results showed a decline by 60% of hornbill encounters. Between 1996-1997, within a month you could encounter an average of 15 times of the hornbill group in the area. Recently, the team could only find 6 groups. Furthermore, the number of group members dropped dramatically. Before the large-scale illegal logging in 1998, there were 12 individuals in the hornbill group. The latest survey in December 2018 showed that the average number of individuals found in the hornbill group was only 4. "In the past, in the forest in Lebakharjo, Ampeldaging Subdistrict, we could find up to 30 hornbills in one group. This would only be a memory because the natural forests in Lebakharjo has been destroyed," said PROFAUNA Indonesia Chairman, Rosek Nursahid. 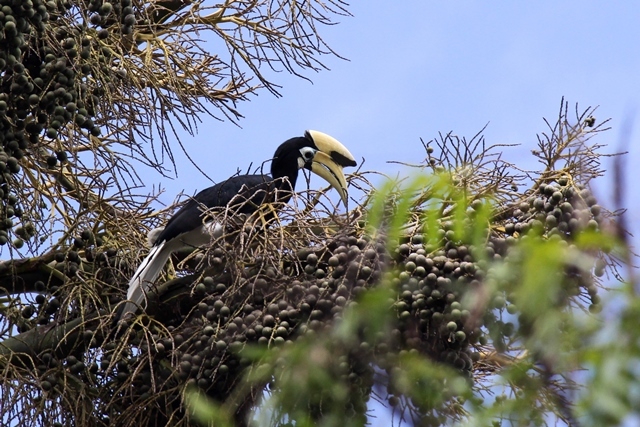 Now, only small numbers of hornbills can still be found in several parts of the areas, including the Sumberagung Forest; Teluk Apusan, Kondang Merak, Balaikambang, Kondang Iwak; Rowo's famous Alas; and Gunung Gajah Mungkur. In addition, the birds can also be found in the Sempu Island Nature Reserve which is one of the main habitats for hornbills. 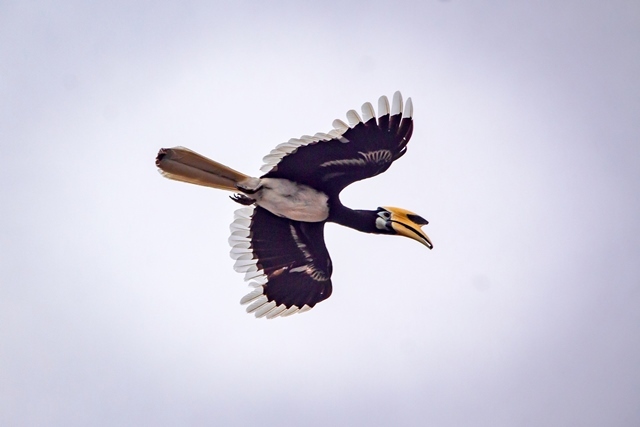 "In the December 2018 survey, the PROFAUNA team only found one species of hornbill, oriental pied-hornbill. We will continue this monitoring and hope that we will find other species like wreathed and rhinoceros hornbills, "said Erik Yuniar, coordinator of PROFAUNA's Lowland Forest Conservation (locally named, KHDR) program. Previously, the forests in the southern Malang were known as the habitats for various wildlife species such as hornbills (3 species), bulls, peacocks, Javan hawk eagles, Javan langurs and leopards. Unfortunately, in 1998, the large-scale illegal logging began in southern Malang. About 41,000 ha were deforested due to the forest looting. The degradation of the forest has threatened the the rare species in the area. The survival of these animals depends on the remaining forests and vice versa, where the forests also depend on the birds such as hornbills because they help spread tree seeds. "Currently PROFAUNA Indonesia is developing a Lowland Forest Conservation programme (locally named as, KHDR) in southern Malang with the approach of key species of hornbill and Javan langur," Erik Yanuar concluded.